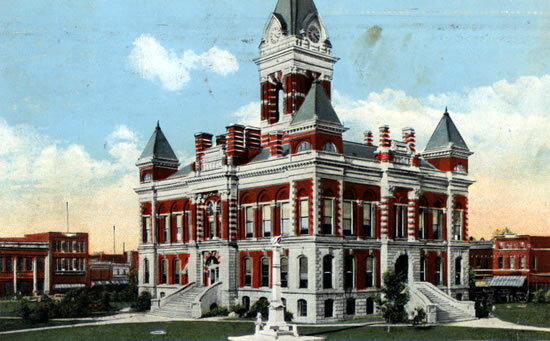 In the Gibson Circuit Court, Gibson County Indiana, January Term 1891. Probate Order Book 11 page 388. Trafton M. Wilkinson, administrator of the estate of Amos C. Wilkinson, deceased, and shows to the court by his sworn statement in writing that said Amos C. Wilkinson died on the 16th day of February 1891, in testate, leaving him surviving as his heirs and only heirs at law, his widow Nancy K. Wilkinson and his seven children John W. Wilkinson, Charles F. Wilkinson, Mary E. Wilkinson, Trafton M. Wilkinson, and Aaron N. Wilkinson, Laura E. Shaw and Susan E. Murphy, and his grandchildren Walter J. Hubble, Nancy H. Hubble, Harlie E. Hubble, and John Felix Hubble, they being the children of a deceased daughter Mahala Hubble.